Home > How-to Guides > Preparing surfaces for decoration > Caulk or silicone sealant? Caulk or silicone sealant? So, what’s the difference? Visually there’s not a lot between these products. Both caulk, and silicone sealant, are supplied in a tube, which is inserted into a cartridge gun where it is then squeezed out along cracks and junctions between all manner of different surfaces in your home. Both products are designed to cope with slight movement between adjacent surfaces, but for the best results in all of your DIY endeavours, there are big differences as to where specifically you should use caulk or silicone sealant. Quite simply, use caulk when the junction you are filling will be painted. Therefore, caulk is ideally suited to being used along corner junctions between walls, cracks between ceilings and walls, and especially areas such as the junction between the top edge of skirting boards and the wall. Caulk is much easier to apply, and smooth to a perfectly neat finish, in comparison to silicone sealant. It’s only real drawback is that water-based paints have a tendency to crack, or craze, when applied straight over the top of caulk, and therefore it is always best to apply an oil-based paint over the caulked junction first, allow it to dry, before overpainting with a water-based paint. Now, you may be thinking, that for a product to be sold as paintable, it’s a bit of a cheek to require this ‘extra’ treatment, and I am inclined to agree, but it’s just one of those things that we just need to accept I’m afraid. Occasionally you do find a caulk that doesn’t crack, but I’ve given up hoping for those rare occasions, and always give the caulk a coat of oil-based undercoat (or Zinsser BIN) before continuing on with my finishing paints. For more information on how to apply caulk, see my guide ‘Preparing ceilings, walls, and woodwork’. 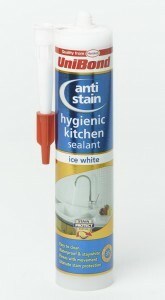 Use silicone sealant along junctions between bathroom fittings and the tiles around them, kitchen worktops and the tiles above them, around kitchen sinks, and basically anywhere where a completely waterproof seal is required. Silicone sealant is simply a much more hardwearing product than caulk, more waterproof and mould proof, and therefore provides the best options for areas such as bath seals and shower screen seals. Also, you cannot paint over the top of most silicone sealants – generally, it just doesn’t work. You can buy acrylic silicone sealants (water-based, and some can indeed be painted over) but personally I would always go for the solvent based options as I find them to be much more effective. Because you can’t paint most silicone sealants there are a number of colour options, whereas with caulk, it’s generally white, as it’s always going to be painted. Finally, be aware that the formulations used in silicone sealant make it much trickier to apply than caulk. For more information, see my guide ‘Tiling walls’. Apart from the bathroom and kitchen applications, silicone sealant can also be used in other DIY jobs around the home. For example it is essential in providing a waterproof seal around many window and door designs, along with securing glazing bars in some types of window. Because of its many uses, there are variations in product formulation to suit the particular job at hand. What’s more, you’ll also often see ‘low modulus’ (stretchy but not the most hardwearing) and ‘high modulus’ (less stretchy but more hardwearing) written on packaging. However, to avoid worrying about which ‘modulus’, and general suitability, silicone sealant is generally supplied under a number of different job specific names, such as bathroom sealant, frame sealant, and glazing silicone, which makes choosing the one you need a simple task. Finally, this guide is more aimed at the UK market, as terminology and uses relating to caulk especially, can be a little different in North America. But one thing that is definitely consistent everywhere, is to make sure you spend that little extra on the big brand products rather than the ‘cheap options’. This is especially the case with silicone, as cheap silicone sealant is not only more likely to fail, but almost impossible to apply neatly. Therefore always go for the best quality you can afford when buying caulk or silicone sealant – it really is money very well spent. This entry was posted on Tuesday, September 11th, 2012 at 1:48 pm and is filed under 'How-to' Guides, Preparing Surfaces for Decoration. You can follow any responses to this entry through the RSS 2.0 feed. You can leave a response, or trackback from your own site.